In an interview on Thursday, Google chairman Eric Schmidt said his company's relationship with Apple has improved over the past year, noting that executives have been holding "lots and lots" of talks to discuss a number of issues. 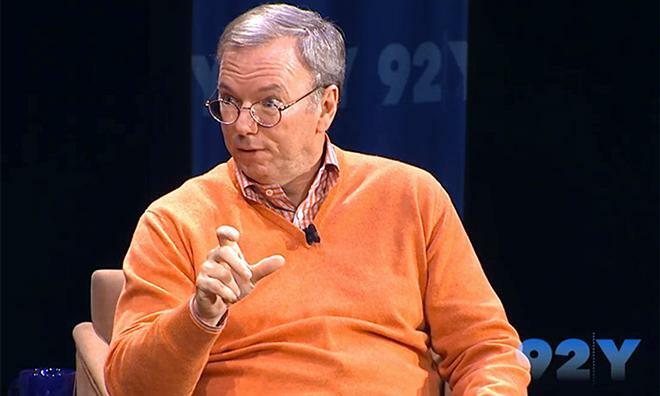 Google's Eric Schmidt during a 2012 interview with AllThingsD. Speaking with Reuters at this year's Sun Valley retreat in Idaho, Schmidt let loose that Google and Apple have been participating in meetings over the past year, suggesting the two companies are working to resolve their differences. Apple and Google are in "constant business discussions on a long list of issues," Schmidt said. While details regarding these issues are left to speculation, Schmidt did reveal that Google's chief business officer Nikesh Arora led many of the meetings. Once reasonably close partners, Apple and Google have drifted apart after the Internet search giant introduced its Android operating system, which has subsequently taken over the global smartphone market. Schmidt said during an interview in October 2012 that the battle between Apple's iOS and Google's Android is the "defining fight of the industry today." Schmidt himself was once on Apple's board of directors, but stepped down in 2009 after the launch of Google's Chrome OS. For its part, Apple has tried to relinquish its reliance of Google data in almost every aspect of iOS. For example, the first five iterations of Apple's mobile OS featured a suite of apps built on Google assets, including Maps and YouTube. With iOS 6, the Google Maps-driven Maps app was replaced by a solution Apple created from the ground up. The native YouTube app was also nixed, as was data feeding Apple's Siri virtual assistant. Google ultimately created standalone versions of the erstwhile native apps, and in the case of YouTube, launched the title before iOS 6 was even released. The original YouTube app's deprecation from iOS was a blessing in disguise for Google, as it freed the company to show ads, something Apple did not allow with the old version. The streaming video site's vice president of sales recently reported that ad revenue had tripled in the past six months, suggesting the app's removal from iOS was a key factor in driving revenue.